In Georgia, property owners are responsible for keeping their premises free of hazards that may cause personal injuries. Failing to do so put others in danger and is simply irresponsible. Property owners must be held accountable when they neglect to keep their property safe and free of hazardous obstructions. If you or a loved one have suffered injuries due to unsafe conditions, call The JW Law Firm. We will fight to make sure you receive just compensation for your injuries. You shouldn’t have to pay for someone else’s irresponsibility. If you’ve been the victim of a slip and fall, first know that you have a limited time in which to pursue a lawsuit. Of course, seeking medical attention should be your first priority, but you also need to see an attorney as soon as possible. If we think you have a viable case, we’ll get right to work. The property owner knew about the dangerous condition or should have reasonably known through due care that it existed. During the investigation, your attorney will review your medical records so that we fully understand the extent of your injuries. We may also ask for a testimony from your doctor in regards to your medical treatment and rehabilitation. We will also evaluate the total damages and losses you incurred because of the accident. This will help us determine how much you should receive in compensation. 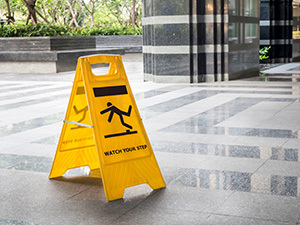 Slip and falls can cause serious injuries that can leave victims debilitated for a long time. Without the ability to work or enjoy the life they had, many victims go through a great deal of suffering. This injustice cannot stand. Under the open and obvious doctrine, property owners are not liable for injuries if the dangerous condition is clearly noticeable. Insurance companies will likely try to ask you leading questions in an attempt to deflect liability from themselves. This is why it’s best to never talk with anyone representing the other party without your attorney present. You don’t want to jeopardize your case before we can negotiate a settlement. Once all of this information has been compiled into a claim, we will begin negotiations with the other party. A successful negotiation ends with you receiving a settlement that is fair and covers all of your damages. If a settlement cannot be agreed upon, we will then take the claim to court. Going to court does not mean that a settlement is no longer an option. Many cases end in settlements because businesses and insurance companies do not want the negative publicity of a trial. Still, if the suit is carried out to completion, then it is up to either the judge or jury to determine a verdict. If you’ve been injured in a slip and fall accident, call The JW Law Firm. We’ll fight for your right to see fair compensation.